Left photo shows Danilo Lagado being assisted by soldiers in unloading water pipes at Brgy. Rubas, Jaro, Leyte. At the right are the farmer-partners, Dir. Domingo Diaz, Col. Dinoh Dolina, Lt. Col. Reymondo Delgado and Bangon Trustees Leo and Gert Blanco during the turnover program on August 20, 2015. JARO, Leyte – The sub-cluster of Bangon Mini Farms Alpha Sector Association Incorporated in the remote village of Rubas, in the mountains of Jaro, recently received 600 meters of polyethylene water pipes from Landbank Dir. Domingo Diaz, the Executive Chairman of Bangon. LBP Dir. Diaz said Bangon’s livelihood systems include the embedding of resilience measures in the farms so its farmer-partners can combat the effects of weather, particularly drought during this El Niño period. The Bangon farmer-partners in the Rubas sub-cluster will no longer have to worry about water for their homes and crops, once the water pipe is connected to a nearby reservoir that is less than a kilometer away. Diaz asserted, “Tama na! Bawal na ang gutom at kahirapan!” during the turnover program attended by Philippine Army officials, Colonel Dinoh Dolina of 802nd Infantry Brigade and Lt. Colonel Reymondo Delgado of the 19th Infantry Battalion, and Bangon Trustees Dr. Leo Blanco, Gert Blanco and Thelma Pondolanan. The military has been LBPs partner in organizing and empowering Bangon Mini Farms since its kick-off in January 2014. The water pipes cost about P52,000.00, which was funded by donations from private individuals. Apart from this, Bangon farmer-partners also benefited from other LBP-assisted programs such as livelihood trainings, seeds dispersal, mindset and values training, regular farm audits, integration into a supply chain and a support organization. Bangon has also established a 100 square meter greenhouse in Rubas to grow high-value crops, which can increase the association’s income by more than P20,000 monthly. Aleshyla Diaz, a member of the Bangon’s Technical Working Group cited that Bangon has installed eight (8) greenhouses at dispersed locations in Leyte as part of its strategy so that one or several of these greenhouses can survive any calamity and thereby provide food to Bangon farmer-partners and clients. According to Diaz, one greenhouse facility is worth P285,000.00 and are now operating in Dulag, Tacloban, Jaro, Carigara, Capoocan, Kananga, Ormoc and Baybay. Gert Cesar Blanco, Bangon Sector Head said the production of high value crops in Rubas should increase further due to its rich soil, healthy micro-climate and proximity to the main markets of Tacloban and Ormoc. The sustainment of mini-farms is crucial for Bangon whose audacious goal is to “end hunger and poverty, one farmer family at a time”, Blanco stressed. Tagbilaran City Mayor John Geesnell “Baba” Yap (right) cuts the ribbon to formally open the Ramon Aboitiz Foundation Inc. (RAFI) Micro-finance branch in his city. With him are (left to right) RAFI Micro-finance & Entrepreneurship executive director Ma. Theresa Catipay and RAFI chief operating officer Dominica Chua. The new branch is intended to help provide a stable and rewarding livelihood to mothers in Tagbilaran. CEBU CITY – To serve more client nanays, the Ramon Aboitiz Foundation Inc. (RAFI) Micro-finance has opened five more branches in Bohol, Cebu, and Leyte, bringing the total number of branches to 23. Last June 25, it inaugurated its Tagbilaran City, Bohol branch, which is located at Door 2, Seaview Apartment, CPG East, Bool District; followed by the opening of its Square One Commercial Complex, Tipolo, Mandaue City, Cebu branch on June 29; the Travelers Inn, Valladolid, Carcar City, Cebu branch on July 2; the Proper Damolog, Sogod, Cebu branch on August 4; and the Taft Street, Central 1, Poblacion, Palompon, Leyte branch on August 20. 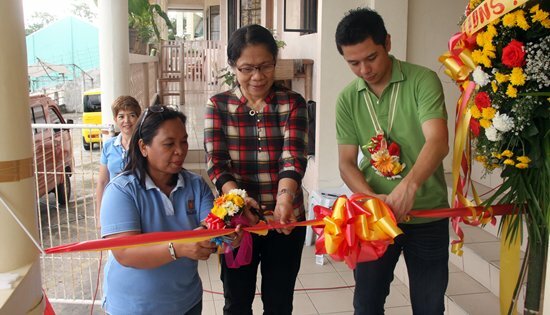 “True to RAFI’s promise of elevating lives, RAFI Micro-finance has committed to provide responsive and value-based micro-finance services to the communities, especially to poor entrepreneurs,” said Jonar Dorado, head of the RAFI Micro-finance Business Development Unit, on the opening of the Tagbilaran branch. “We are currently serving over 46,000 families in the provinces of Cebu, Bohol, and Leyte, and determined to reach out to 120,000 families in the next three years, by expanding our operations through the opening of branches within and beyond the areas we currently cover,” he said. RAFI Micro-finance aims to provide capital to nanay business entrepreneurs and to those wanting to establish their own small economic ventures as a way to empower them as co-pillars of their respective families. Aside from loans, it also provides micro-insurance seminars, business trainings, consultancy, medical missions, and other services. Hazel Guille, one of those who attended the Carcar branch opening, was ecstatic that RAFI Micro-finance already has a branch near her. “Nalipay kaayo ko ug nagpasalamat nga aduna nay branch nga duol diri sa Carcar kay sa una muadto pa ko sa Argao branch," she said. RAFI Micro-finance is a program under the Micro-finance & Entrepreneurship focus area of RAFI. It provides financial resources and know-how to women micro-entrepreneurs to nurture financial independence and entrepreneurship. Other focus areas of RAFI are Integrated Development, Culture & Heritage, Leadership & Citizenship, and Education. TACLOBAN CITY – Two provinces and 5 towns in Eastern Visayas passed the 2014 Seal of Good Local Governance (SGLG) of the Department of the Interior and Local Government (DILG). DILG-8 Regional Director Pedro A. Noval Jr. revealed today that the SGLG awardees in Region 8 are the provinces of Biliran and Northern Samar, and the municipalities of Barugo, Carigara and Jaro in Leyte; Limasawa in Southern Leyte; and Gandara in Samar. The seven winning LGUs passed all three (3) SGLG Core Indicators namely, Disaster Preparedness, Social Protection, and Good Financial Housekeeping; and at least one (1) other Essential Indicator (either Business Friendliness and Competitiveness, Peace and Order, and/or Environment) to earn the highly coveted award. Dir. Noval expressed happiness that seven local government units (LGUs) here were able to pass the high standards of the SGLG in its first year of implementation. He is optimistic that more will be able to earn the SGLG nod in the coming years. “Most LGUs in Eastern Visayas are actually passers of the Seal of Good Financial Housekeeping (SGFH), and if they are able to maintain that and perform well on DRRM and other indicators, it would enable them to cop the SGLG award,“ Dir. Noval said. He said LGUs in the region could improve more on Social Protection, particularly on compliance to the Accessibility Law for persons with disabilities. DILG Secretary Mar Roxas launched SGLG in 2014 to build on the successful run of the Seal of Good Housekeeping (SGH) that was introduced by his predecessor the late Secretary Jesse M. Robredo. SGLG challenges LGUs to continue good governance practices and improve basic services, in addition to measuring their compliance to the Full Disclosure Policy and observance of COA guidelines. To ensure objectivity, DILG cross-posted DILG field officers during the evaluations. The SGLG criteria is a product of a series of workshops and consultations with trained DILG personnel. Dir. Noval said DILG shall hold appropriate awards rites this September in each winning LGU, where the SGLG Marker will be formally conferred and installed in a conspicuous area in the municipal hall. Further, SGLG recipients will have the opportunity to avail of the DILG Performance Challenge Fund (PCF) to be used for development projects. Under SGLG, the PCF incentive fund for each winning province is P7 million, while for municipalities it is now P3 million each – up from P1 million under SGH. Troops of 14th Infantry Battalion with Dolores PNP and CENRO Dolores during the confiscation of 1,120 board-feet Dipterocarp lumber in Brgy 2, Dolores, Eastern Samar on August 13, 2015. CAMP LUKBAN, Catbalogan City – Army troops under the Oras based 14th Infantry (AVENGER) Battalion, Dolores PNP and Dolores Eastern Samar Community Environment and Natural Resources Office (CENRO) confiscated 70 pieces of Dipterocarp lumber totaling 1,120 board feet at Barangay 2, Dolores, Eastern Samar last August 13, 2015. 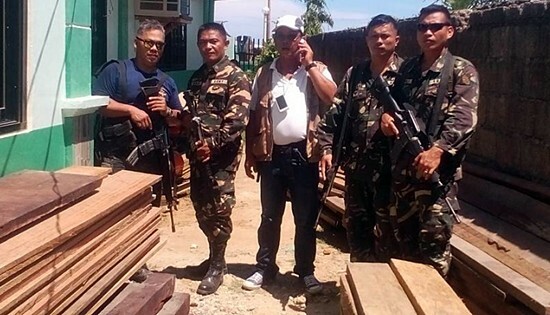 In a report from Lt. Col. Peter B. Burgonio, Commanding Officer of the 14th Infantry Battalion, DENR Region 8 made coordination with 14th IB to assist them in confiscating the lumber while issuing apprehension receipts in violation to section 77 RA 7161. The forest products, upon confiscation, were brought and placed in the custody of CENRO, Dolores, Eastern Samar for proper disposition. It can be recalled that in first semester this year, the 8ID, together with the Provincial and Municipal local Chief Executives, spearheaded the declaration of their areas as insurgency-free, thus, paving the way for the line units of the Division to focus their efforts on non-traditional role. Meanwhile, another 1,149 board feet of illegally cut Lawaan lumber were confiscated by the elements of 802nd Brigade, Burauen PNP and Burauen MENRO in a joint anti-illegal logging operation at Barangay Matin-ao, Burauen, Leyte last August 12, 2015 that netted them 1,419 board feet of Lawaan lumber. The confiscated pieces of lumber were brought to Burauen Municipal Hall for safekeeping prior to its turn-over to proper DENR unit. The accomplishments are results of the Command’s convergence efforts with various stakeholders throughout Eastern Visayas where the Army has set focus more on non-traditional role of assisting other government agencies to enforce laws. Maj. Gen. Jet B. Velarmino, 8ID Commander, lauded the joint anti-illegal logging operations of the Army, the PNP and DENR in enforcing environmental laws. Further, he reiterated that 8ID under his Command will continue to support the DENR in implementing its environmental protection programs. PASAY CITY – Senator Chiz Escudero favors an increase in military spending to boost the country’s defense capabilities amid concerns over China’s continuous military buildup in the disputed West Philippine Sea, but warns the government against buying old and dilapidated second-hand weapons and equipment. Escudero said that as much as possible the government should purchase “brand new” military hardware if it really wants to modernize the Armed Forces of the Philippines (AFP), which is widely regarded as one of the weakest military forces in Southeast Asia. “If we are going to pour in billions of pesos to improve the AFP, we might as well give our soldiers the best modern and sophisticated equipment we can get,” Escudero pointed out. The veteran lawmaker said it is high time the Philippines invests in “reasonably priced” brand-new military weapons and equipment, especially those that would improve the country’s maritime defense capability. Under the proposed P3.002 trillion national budget for 2016, the Department of National Defense (DND) ranks third among the line agencies with the highest allocation, next to the Department of Education (DepEd) and the Department of Public Works and Highways (DPWH). The 2016 budget proposal of the DND, which exercises supervision and control over the AFP, is P172 billion. It is P27.5 billion higher than its current budget of P144.5 billion. On top of this, the government has allocated P75 billion for the first five years of implementation of the 15-year Revised AFP Modernization Act of 2012. Even as he lauded the current administration for making long-needed investments in the military in recent years, Escudero said more needs to be done before improvements within the AFP can be felt. Escudero said while the Department of Budget and Management reported that a total of P68 billion has already been spent to modernize the AFP since 1999, the much-needed and long overdue upgrades to the country’s armed forces remain elusive. It is for this reason, he said, why the Senate has initiated a probe on the implementation of the modernization program aimed at upgrading the AFP, including the alleged irregular acquisitions of military equipment and weapons system. The DND recently came under fire for the purchase of 21 refurbished “Huey” helicopters worth P1.2 billion. There were allegations that the choppers, said to be older than the incumbent senior military officers, cannot be used and have obsolete parts, and that the purchase violated certain provisions of the country’s procurement law. The big-ticket project was also supposedly tailor-made for a particular supplier in exchange for kickbacks. The AFP Modernization Act, also known as Republic Act (RA) No. 7898, became a law in 1995 under the leadership of then President Fidel Ramos, who himself served as AFP chief and DND secretary during the time of President Corazon Aquino. The law was meant to modernize all branches of the AFP such as the Philippine Air Force, the Philippine Navy and the Philippine Army. It was intended to last for 15 years with an initial budget of P50 billion for the first five years, but the funding was stopped due to the 1997 Asian financial crisis. After the financial crisis, funding for the AFP modernization was halted and later neglected by successive administrations until the law expired in 2010. In 2012, RA 7898 was amended by RA 10349, or the Revised AFP Modernization Act, which extended the modernization program to another 15 years with an initial budget of P75 billion for the first five years in order to continue upgrading all military branches and boost the country’s defense system. JAKARTA, Indonesia – Existing coal plants in Indonesia cause an estimated 7,100 premature deaths every year according to research by Harvard University and Greenpeace Southeast Asia – the first of its kind to look at illness and deaths associated with Indonesia’s coal-fired power plants. This number could climb to over 28,000 per year if the Indonesian government goes ahead with an ambitious rollout of more than one hundred new coal-fired power plants. "Emissions from coal-fired power plants form particulate matter and ozone that are detrimental to human health. Indonesia is one of the countries in the world with the largest plans to expand coal-fired power generation, yet little has been done to explore the associated health impacts. Our results show that planned coal expansion could significantly increase pollution levels across Indonesia. The human health cost from this rising coal pollution should be considered when making choices about Indonesia's energy future,” said Shannon Koplitz, lead Harvard researcher in the project. BEIJING – Greenpeace East Asia welcomes the recent retraction of the American Journal of Clinical Nutrition, on the genetically engineered (GE) ‘Golden’ Rice paper by Guangwen Tang, as an important step in upholding ethical standards in research. Jing Wang Greenpeace East Asia, Food and Agriculture Senior Campaigner said: “The students and their parents who were involved in the study were not provided with sufficient information before the feeding trials were conducted, of particular concern given that the food safety of GE crops is still a controversial question in the scientific and academic world.